The standout is very important when laying out can lights and measuring on a ladder. This one is great. Use it daily. Perfect for trim and finish work. Beats lugging around a 35' all day. I have woned a few of these through out the years. None have been the 16' version as I have no need for a tape so short. I have owned several in the 25-30' range. They work well, however being a roofer I have yet to find a tape that can take a drop from the roof. The 16' in particular is a great fit in my hand, but the entire FatMax line of tapes is fantastic. The blade standout is phenomenal at over 10', and the vinyl blade armor at the end of the tape really does help protect the tape. Great little tape. Fits nicely in the hand and good stand out for 16'. HD has this and the 25' in a pack, $20 for both. Like the other posters we use and recommend these. Similar to overanalyze, I prefer the 16' over the 25' unit. Anything longer than 15' I'm probably using a Dista. 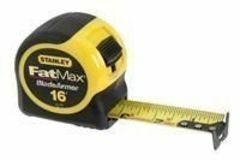 Once you go Fat you never go back; do not buy the Stanley Max. It is different and definitely lesser quality. I've found these to be the best tapes when measuring window openings. Especially a big 8' four lite casement or other large opening. I never need someone else to hold one end of the tape. The stand out is fantastic both horizontally and vertically. I'm on my fourth one. Only because I will sometimes forget and leave it at a potential customers house. A couple of times, I've been able to recover them. The others, the potential client ended up with an EXCELLENT tape. LOVE fat max tapes. 16 is handy and 35 will stick way out there. Thoughts on Stihl BT 131 Auger? Code on 4" water heater flue?